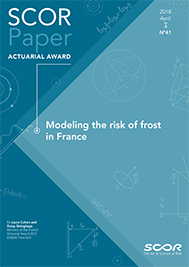 This SCOR Paper, an overview of the winning dissertation at the 2015 French Actuarial Awards, aims to design a catastrophe model for the risk of frost in France. When natural disasters are discussed, frost risk is rarely mentioned because its occurrence does not usually have as dramatic an impact as earthquakes, hurricanes, or volcanic eruptions. However, the duration of a frost event, as well as the high number of affected policies, can lead to heavy losses. The SCOR Paper “Modeling the risk of frost in France” sums up an article that aims to build a catastrophe model for frost risk, allowing to simulate the occurrence of this risk and its related losses. This modeling is done in four stages. The first section establishes a clustering of the regions of France based on their temperatures, in order to reduce the amount of information available.The following two sections detail the construction of two modules of a catastrophe model, adapting them specifically to frost risk. The first module allows to generate frost events in France over a year and the second module attempts to calculate the impact of these events on the AXA portfolio, translating physical events into economic losses. The last section studies the distribution of losses caused by frost that are obtained as outputs of the model. The full research article, available below (in French), has won the French Actuarial Award 2015.